Richard Strauss (1864-1949) was born in Munich and by the turn of the last century he had become a composer of Lieder and tone poems of international significance. 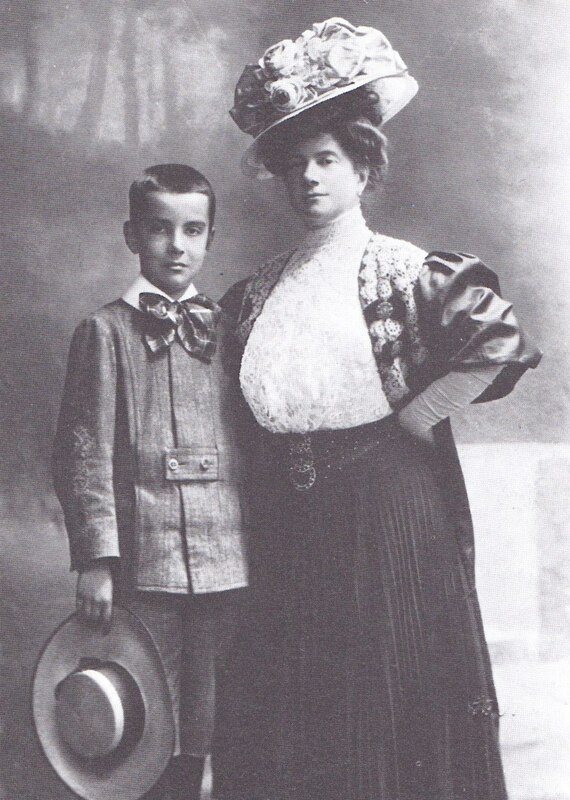 In 1894 he had married the German soprano, Pauline de Ahna (1863-1950), and together they formed a formidable performing couple, touring extensively across the whole of Europe. 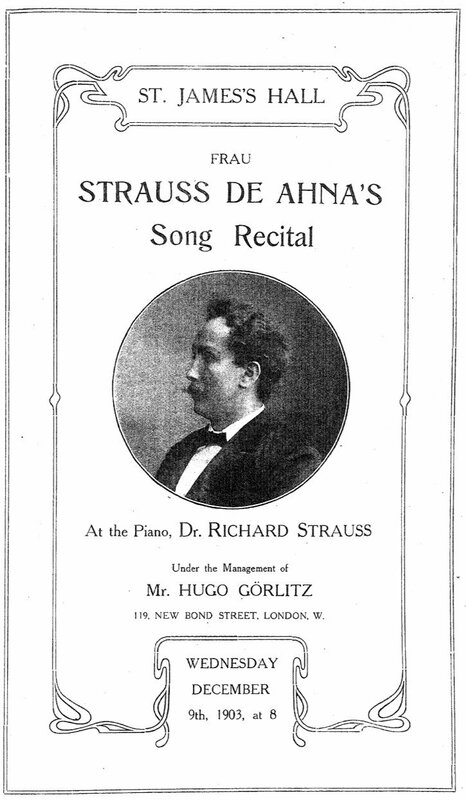 It was the London-based concert manager, Hugo Görlitz, who organised the visit of the Strausses to Britain at the end of 1903, primarily so that Strauss could conduct a Berlioz Centenary Concert at the Queen’s Hall on 11 December that year. How enterprising it would be, Görlitz no doubt thought, to arrange for Pauline to sing some of her husband’s sensational songs while they were here. The location was booked: the bleak, old St James’s Hall in Piccadilly, opened in 1858 and destined to be demolished barely eighteen months later in the summer of 1905. (It is now the site of the Méridien Piccadilly Hotel.) The date also was set: Wednesday, 9 December 1903. Hopes must have been high that Pauline would restrain her fiery temperament – even Strauss in his turbulent yet happy marriage would refer to her as ein Igel, ‘a hedgehog’. The programme consisted of sixteen of Strauss’s songs, many of them core-repertoire for today’s sopranos; it even included – a heart-stopping thought – the world premiere of Gefunden, a piece so fresh that it still awaited an opus number. On the night critics were there in some force; such routine extensive coverage of single concerts can only make modern music-lovers sigh. (Nowadays reviews of a one-off recital are rather less frequent. Where is the commercial gain when there will be no repeat?) The critics’ reactions, however, generally fell short of enthusiastic. Of the final phrases of Winterweihe (1900) The Times said that they were ‘surely more quaintly curious than either beautiful or really effective’. Although the Observer admired the ‘harmonic eccentricities’ of Jung Hexenlied (1898) which the composer seemed ‘to revel in with boyish glee’, The Times questioned whether so exaggerated a setting of a poem could be ‘called a song in so many words, in spite of its brilliant cleverness’. At least mercy was shown to the brand-new Gefunden, which the Manchester Guardian found ‘delightfully melodious and poetical’. The critics were tough on Frau Strauss de Ahna too, describing her voice as ‘rather small’ (The Times) and ‘not always satisfactory to English ears’ (Observer), and overall the man from The Times ‘found the ordeal trying’. It is scarcely an exaggeration to say that present-day lovers of classical song would have committed a minor crime to get hold of a ticket for such a night as this, but that was not the case in 1903. The Manchester Guardian regretted that the hall ‘was not filled as it should have been’, while the Illustrated London News reported that the Berlioz Centenary Concert two days later had been ‘lamentably attended’. The following year the German critic, Oskar Schmitz, cast Britain as a ‘land without music’. This was hardly an original premise, but it chimed with the mood towards Anglo-German cultural relations at the time. It was not entirely fair, though. On 14 October 1903, for instance, for the first night of Elgar’s oratorio The Apostles, the vast Birmingham Town Hall was packed to such an extent that extra seats had to be brought in. In the event, Richard Strauss left London just before Christmas 1903, undoubtedly disappointed by the smallness of the audiences he had attracted. The following spring he toured the United States to the acclaim of an altogether more appreciative public. Meanwhile, British hauteur and a restrained xenophobia had held the field. Neil Robson writes and speaks regularly on the history of south-west London. He is the editor of the Wandsworth Historian. British Library, Music Collections: ‘Richard Strauss Festival (1903), ref. d.487.b. Illustrated London News, 19 Dec. 1903, p. 964. Manchester Guardian, 10 Dec. 1903, p. 8. Observer, 13 Dec. 1903, p. 7. The Times, 4 Jun. 1903, p. 5; 15 Oct. 1903, p. 4; 10 Dec. p. 5. Wilhelm, Kurt, Richard Strauss: an intimate portrait (Thames & Hudson, 1989), espec. pp. 56-69. A reconstruction of the night of 9 December 1903 was given in performance as part of the London Song Festival on 11 November 2014 (www.londonsongfestival.org). This entry was posted in Essays and tagged edwardian music, richard strauss. Bookmark the permalink.